Thank you for trusting North Texas CDC with your business financial needs. NTCDC is committed to providing you with the best customer service in the industry throughout the life of your loan. Our servicing team tackles all the intensive aspects of SBA loans after closing, including loan modifications, deferments, restructures, increases, forbearances, rate changes, and re-amortization of payments to collateral and guaranty releases. We monitor UCC-1 expirations and ensure continuations are filed, if applicable. We keep a record of real estate, business personal property, and other types of insurance as needed. On your behalf, we also request and monitor the receipt of annual financial information from borrowers and guarantors in order to comply with SBA guidelines. Current Property Tax Receipts. We need each year’s real estate and personal property tax statements with evidence of payment. Property taxes are due January 31. Please send in your county tax receipt or evidence of the payment plan. Current Property Insurance Certificate. Please send in a copy of the renewal certificate before or within 30 days of expiration. Current Financial Statements. After each year end, please send a copy of the Tax Return on your Business as well as Personal Financial Statement and Tax Return of each of the guarantors. (413 Form hyperlink) Please submit your tax returns to our office no later than three (3) months after your fiscal year end. 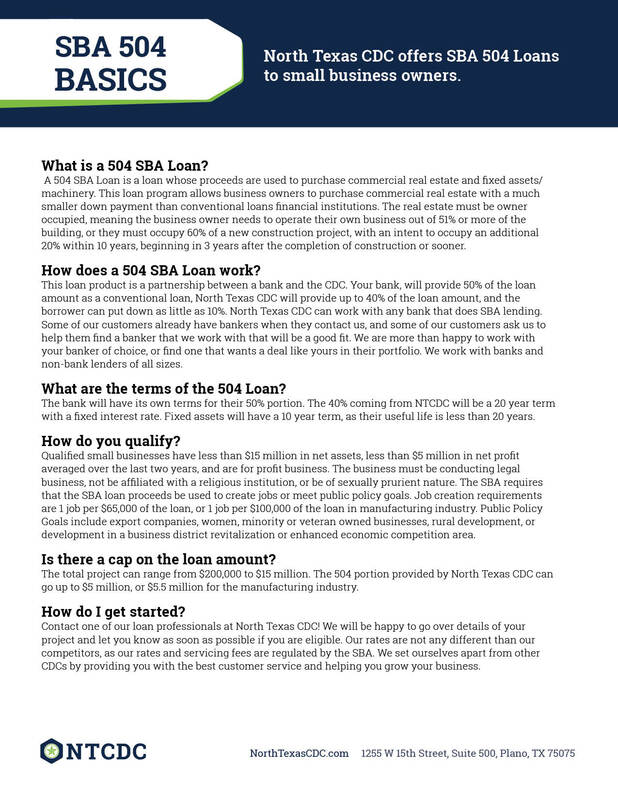 A requirement of the SBA 504 Loan was to create and/or retain a certain number of jobs. NTCDC is required by the US Small Business Administration to obtain this information at the two year anniversary of the loan funding date. Payments are due on the first business day of each month, and are made by automatic debit coordinated by the Central Servicing Agent (“CSA”), Wells Fargo. If an ACH reject occurs the payment will need to be wired. Late fees are due if payment is received after the 15th of the month. Check the Loan Amortization Schedule provided to you after your loan funded. If you cannot locate the Amortization Schedule, contact our office for a copy. Please note that the loan balance is not the same as the loan payoff amount. Your Note Rate is shown on the Note and Amortization Schedule included with your loan documents. The rate stated on the Note does not include the SBA, CSA and CDC servicing fees; however, the “Effective Rate” as referenced in your Notification of New Funding letter does include these fees. The submissions of annual financial statements and/or tax returns are part of the loan commitment. The actual prepayment amounts are available on the 6th business day of the month and payment must be received by the 3rd Thursday of same month. All prepayments must be made by wire transfer. 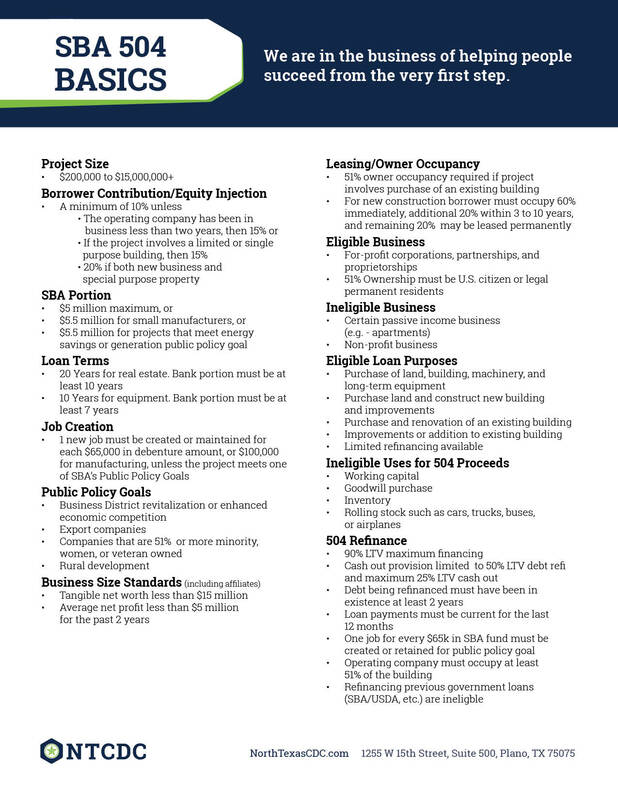 A 30 day notice is required for NTCDC and 1st Lien lender. No partial payments are allowed. What are the requirements to subordinate the 1st Lien? Updated Personal Financial Statement (dated within 90 days). If unavailable, blank form is attached for their convenience. NOTE: PERSONAL FINANCIAL STATEMENT MUST ALSO BE SIGNED BY SPOUSE. Once we receive ALL the information, the request will be submitted to SBA for approval. Normal processing time from SBA is 3-4 weeks.